Get Double Gold, XP, Rep, and CP on the PTR server all weekend! But if you just can't bear to leave the regular servers, you'll still get 15% more Gold, XP, Rep, and Class Points... but you'll be missing out on primo farming bonuses! Happy 13th Anniversary, Artix Entertainment! 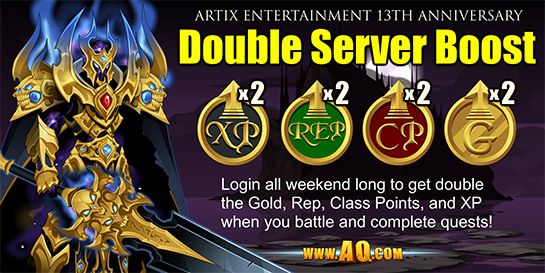 To help Artix Entertainment celebrate its 13th anniversary, we have a DOUBLE server boost weekend happening now! 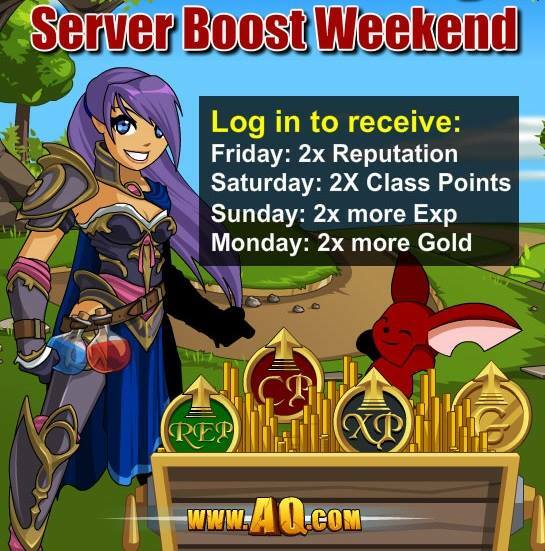 Log in all weekend long to get double the rep, xp, gold, and class points all weekend long! Log on and Battle to get More Rewards! Log in now for our Labor Day weekend server boost and get 25% more reputation to help you rank up in the new Brightoak Grove rep faction and hub town! MEMBERS get 50% MORE reputation! Let Freedom Ring... and Server Boosts Double! Log on all weekend long at www.AQ.com to celebrate freedom, chaos, pink (...maybe! ), fireworks, and DOUBLE server boosts! The Canada Day gear is already in the July Holiday Shop in your game menu. Tomorrow is Independence Day for the United States, and we'll be adding even more celebratory gear then! 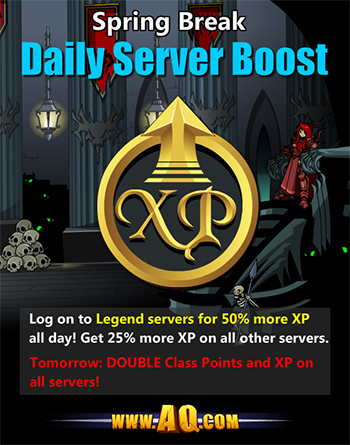 Today's Server Boost: 50 and 25% MORE XP! It's that time of the year for fun, frenzy, and FREE boosts! Since so many of our players are on Spring Break this month, log in every day this week AND this weekend to get MORE class points, rep, gold, or XP during our Spring Break Server Boosts Bonanza! Take Down the Frostspawn General for a Rare Prize! 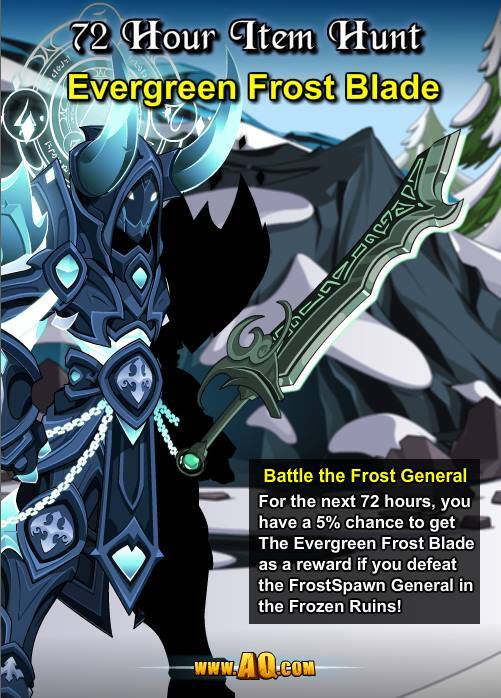 Starting tonight and through Monday, December 29th, head to the Frozen Ruins (/join Frozenruins) and defeat the FrostSpawn General for a 5% chance to get the limited-time rare Evergreen Frost Blade! He's not cool enough to beat you... right? 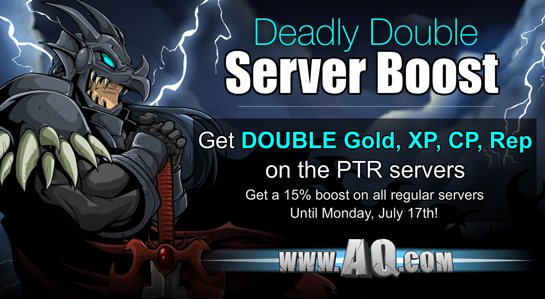 DOUBLE Server Boost Until Monday! 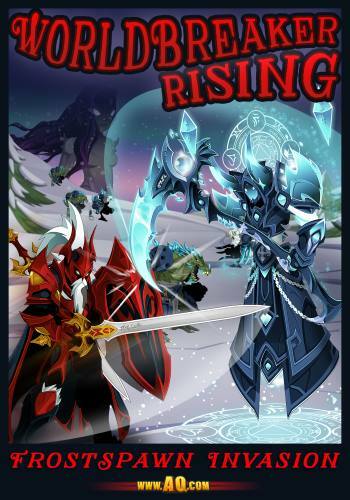 SO many heroes are off school and work this weekend for the holidays that we've got another Frostval gift for you! More Rep, Class Points, XP, and Gold! 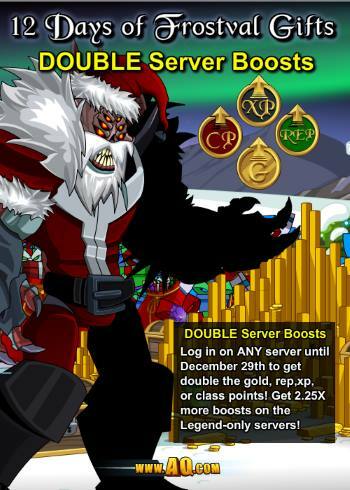 Log into ANY regular server to get 2X more boosts. Log into Sir Ver or Evil Sir Ver to get 2.25X more! The Frostval Fiend gear is available in Quibble's shop! Talk to Quibble in Battleon, because his bountiful chest now has MORE cool gear... including the Icy Claws armor, Frostval Fiend gear, Nully Claws pets, and more! Then check your inventory, because Tinsel's giftboxes have opened! You'll find the Northlands Guardian armor, helm, swords, cape, and pet. Merry Frostval, heroes! And last, but certainly not least, Dage the Evil's giftboxes for the Undead Legion have ALSO opened! Turn in your Legion Tokens to get your gloves on the Black Death of the Legion and Death's Head pet from the Undead Legion Merge shop now! The third part of our WorldBreaker Rising holiday event begins next week! Confront Karok the Fallen in battle and see what happens when the Queen of Monsters sees just how destructive her future on Lore could be! The New Year's map and seasonal rares will ALSO return next week, along with a rares shop and another holiday server boost! 'Tis the season to be battling in AQWorlds!